The techniques Natalie Bray pioneered and perfected revolutionised dress pattern designing, assisting the rise of the modern fashion industry. Her teaching has had a profound influence on design, production and education and her works are classics: fashions change but the principles of designing patterns in the flat do not. 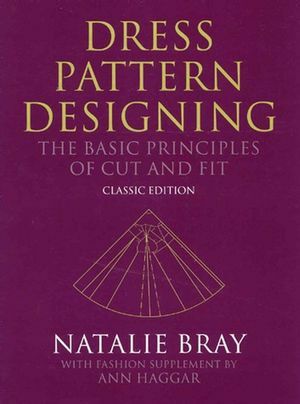 This book - the most popular of Natalie Bray's three works - covers the basic course and includes measurement and block patterns, circular patterns, simple pattern designing, yokes, dart manipulation, sleeves, collars and necklines, skirts, and the one-piece dress foundation. Natalie Bray trained in Paris while connected with a Court dressmaking business in London. The techniques she pioneered and perfected revolutionised dress pattern designing. Her teaching has had a profound influence on design, production and education. Ann Haggar, who wrote the Fashion Supplement, has many years’ experience both in industry and in education, and combines her writing with teaching at St Martin’s School of Art and with couture. Applying the Metric System to Practical Pattern Designing. One. Measurements and Block Patterns. Two. The Bodice Block (bodice Analysis). Three. Using the Bodice Block (Introduction to Pattern Designing). Ten. Necklines, Revers, Rever-collars, Capes. Thirteen. Designing Skirt Patterns (Gores). Fourteen. Fullness in Skirts: Pleats, Folds, Gathers. Appendix One: The Simplified Bodice Block. Appendix Two. Adjustments to Sleeve. Dartless Bodice Block (with Shoulder/Bust Dart Removed). Simple Kimono and Raglan Blocks. Wrap and Strap (or Placket) Openings.